Is there a knitter anywhere who has not had to work in a too-short end? The fix often smells faintly of desperation such as a dot of glue, or spells a lot of hard work, such as undoing the knitting to lengthen the end. Here is a classic dressmaking technique which may save the day next time you're faced with an end too short to work in by conventional means. 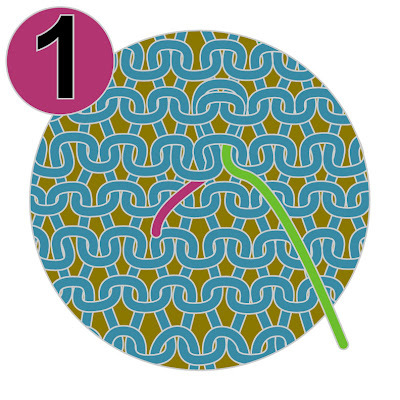 In illustration 1, there are two ends waiting to be worked in: one green and one pink. The green end is long enough to work in by the ordinary "skimming in" method, so first we'll see how that works. Then we'll look at the variation on this method which is a clever dressmaker's trick to work in the very short pink end. Illustration 2 shows threading the green end through the eye of the needle. 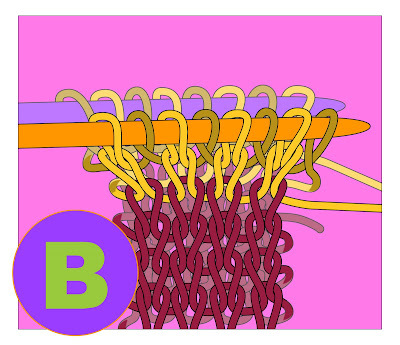 Illustration 3: Pierce the needle through one or two plies of each underlying stitch, as shown. 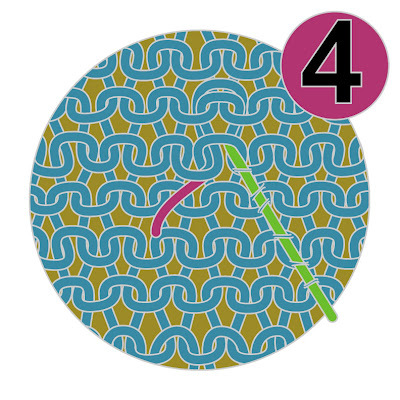 With the too-short end, this simple technique will not work, because the end to be worked in is shorter than the sewing needle. 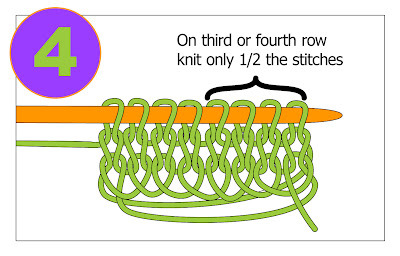 So, as shown in Illustration 5, if the yarn cannot be brought to the needle, the needle must be brought to the yarn. 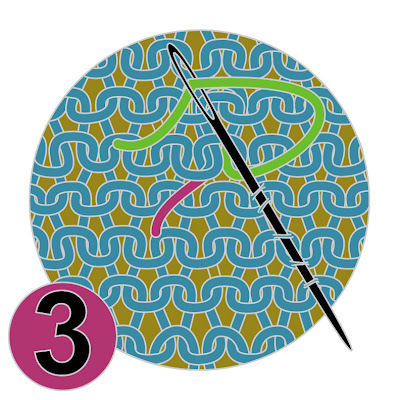 This is done by using the unthreaded needle to pierce through one or two plies of several stitches, as shown. Illustration 6: Stop the needle when the eye is just opposite the too-short end. Without moving the needle, use some form of sewing ingenuity or employ some tiny tools such as a tiny crochet hook, or a needle-threading hook, or a wire threader for hand sewing to draw the too-short end through the eye of the needle. 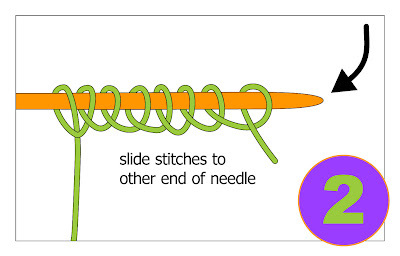 Once the needle is threaded, draw up the needle, and keep drawing it up. 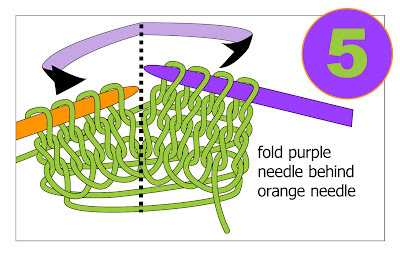 As the needle travels through the fabric, the too-short end be drawn out of the eye, and will come off in the fabric.In other words, the needle will come out naked, but along the way, the too-short end will have been worked in to its fullest possible length, and illustration 7 shows the finished result. 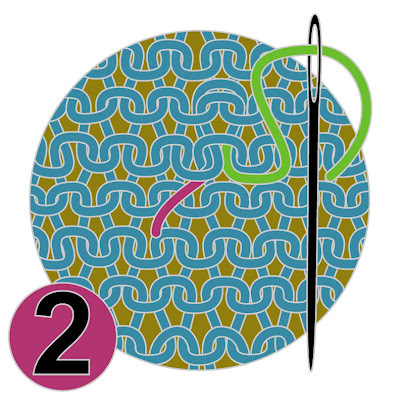 One final note and two final links: The sort of needle to use for this job is a sharp pointed needle, and this is because you want to pierce through the underlying yarn. 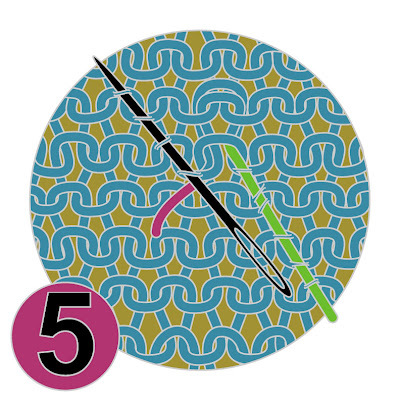 For more info about the two different types of sewing needles, click here. And, just in case you missed the link above for more information about the "skimming in" technique, click here. 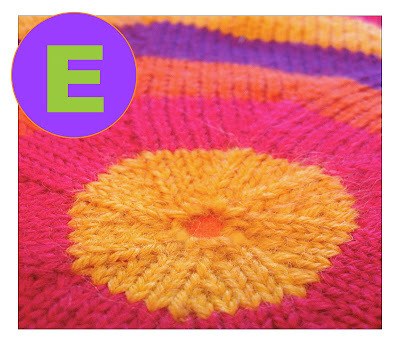 You have been reading TECHknitting on: "working in short ends in knitting"
Knitters often ask about making the cast-on edge match the bound off edge. 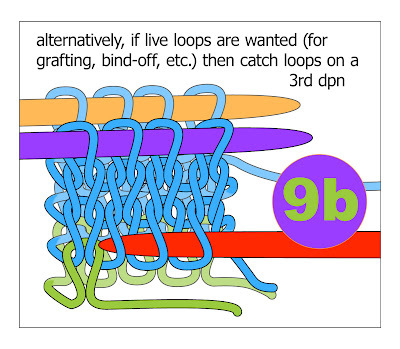 ("Bind off" is also sometimes called "cast off," the two terms are interchangeable.) 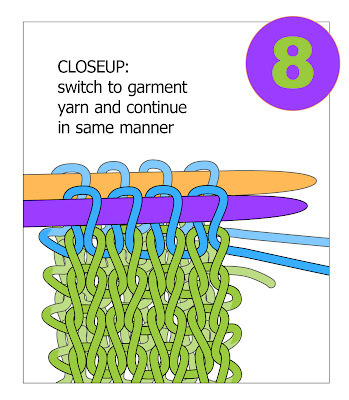 Making matching edges is especially important for knitting with lots of long edges, where the edges are close together: this scarf, for example. 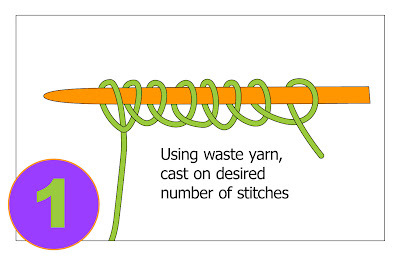 Although this blog has touched on this issue in other posts, today's post puts it all together in one place: a TECHknitting round-up of how to match cast-on and bind-off. 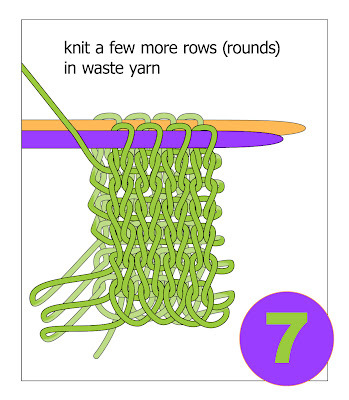 At the bottom of each method are the links to the illustrated how-to's. Do a provisional cast on. Knit your garment. 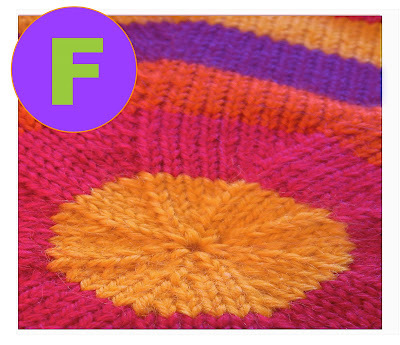 Bind off using any method you like. Go back to the beginning of the work and remove the provisional cast on. 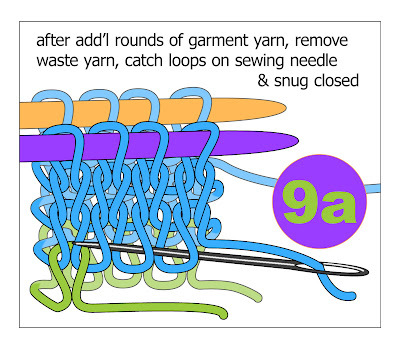 Now, bind off the live stitches using the same bind off method you used at the garment end. The two ends HAVE to match because they were done exactly the same way. Cast on, using any method you like. 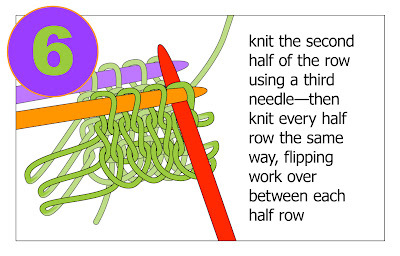 Knit at least 5, and perhaps as many as 10 rows in plain stockinette. This makes a rolled edge to your garment. Start the garment according to the patten such that the stockinette roll rolls to the outside of the garment. At the end of the garment, knit the same number of rows of stockinette--again arranging matters so that the stockinette roll is to the outside. 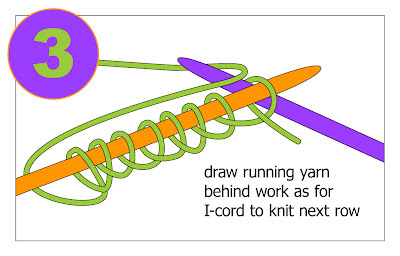 Bind off using any method you like. The stockinette rolls at the beginning and the end of the garment will hide the casting on and the binding off--the garment edges will therefore match: even though the cast on does not necessarily look like the bind off, no one will ever see them. The chained cast on (also called the cable cast on) looks a good deal like an ordinary stitch-over-stitch bind off. 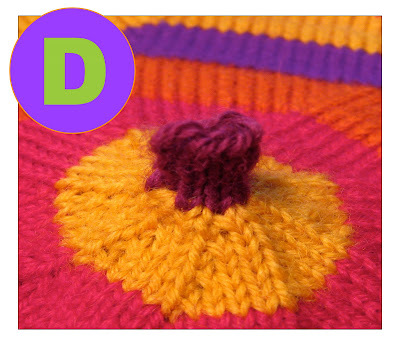 If you use the cable chain cast on and the stitch-over-stitch cast off, you will have two edges which match closely. 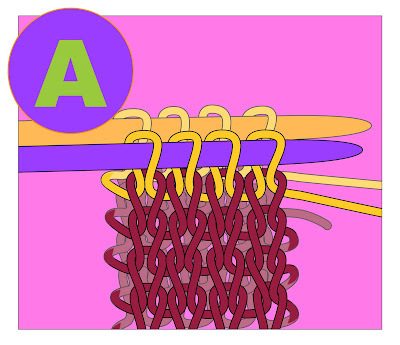 Chain cast-on, also known as "cable cast-on" or "knitting on"
When an item is hemmed at both the cast-on and the bind-off, the edges look identical because they are identical. Have you got a match-matchy method you like?